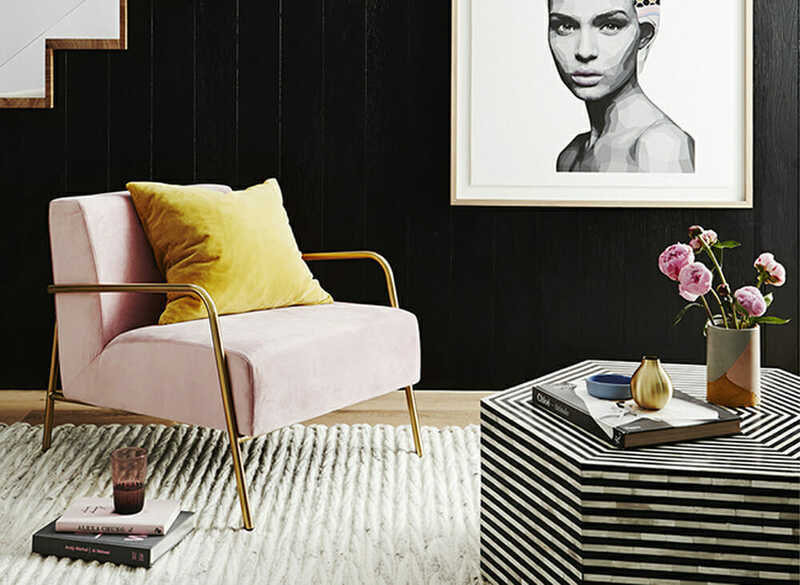 As 2018 is flying by, we are keeping a close eye on the latest and most exciting design trends that this year is bringing along! Last year Salone del Mobil gave us some hints about what to expect. The one thing we always want to change or update is our home and this is totally fine since it usually reflects the changes that we want to make to ourselves. So what are you up to? Are you looking forward to make some transformations into your house? Read on to find all the latest 2018 interior design trends. 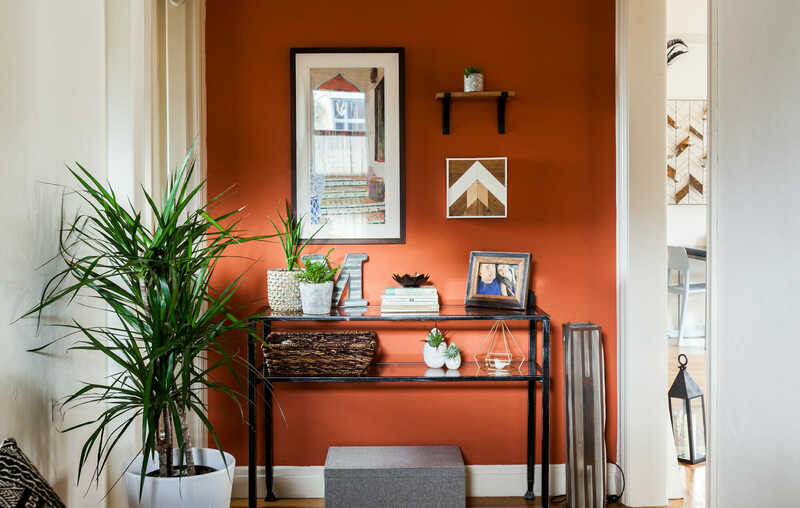 Apartment design by Decorilla designer, Corine M.
Red: One of the first hints about this year’s color interiors design trends came from Benjamin Moore’s color of the year. It is called Caliente and it is a rich bold red. But it is not only red that it is making a comeback. All shades and tones of red and orange/ tangerine will be taking over the interiors. Entryway by Decorilla Designer, Christine M.
Warm colors: Browns and beiges will give an earth tone in our homes this year. 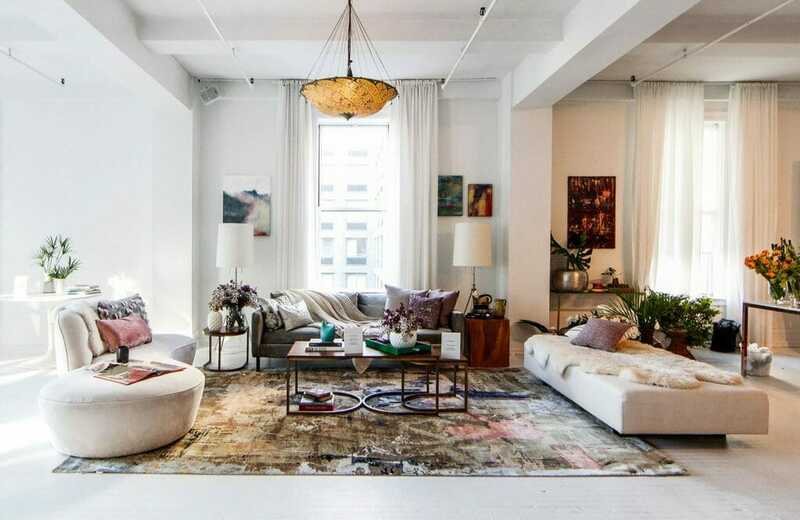 Although the last years, grey was most commonly used as neutral, now it seems that beige and the warm palette is going to replace the cool hues. Master bedroom design by Decorilla Designer, Kelly E.
Millennial pink: in case you were wondering, pink will be with us one more year for sure. People hate it or love it but as it has introduced a new color palette in interiors no one can deny that it is an interesting color bringing interesting results. Dining room design by Decorilla designer, Riddhi M.
A large change is taking place in interior design and we must admit that it feels right. 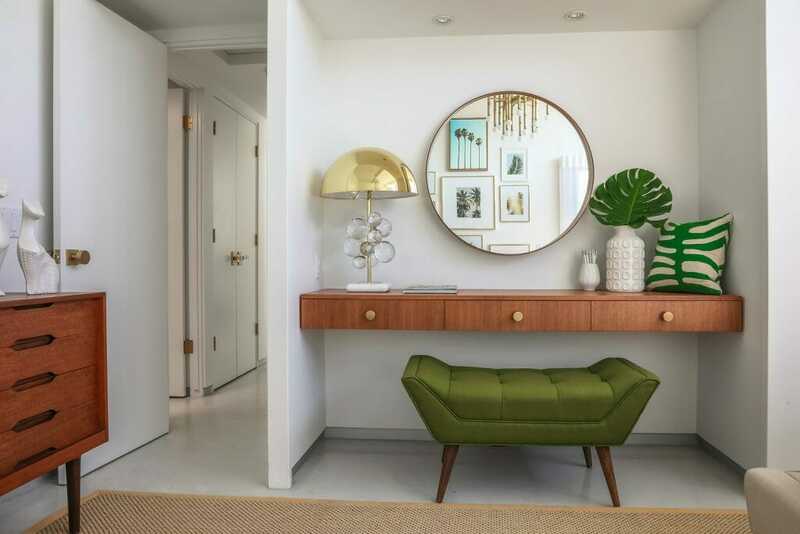 Curves and smooth edges are all about comfort and it seems that attractive organic shapes will be replacing boxy edges and clear lines in furniture. Puffy sofas and comfy chairs in interior design; arches in architecture! It looks like we got tired from the austerity of the straight lines and rectangular shapes and that we are moving towards round shapes and smooth fabrics. Don’t forget that most of the times these new shapes are clearly referring to furnishings from another decade. Is it the 70’s that are coming along with the curves or is it our idea? Bedroom nook design by Decorilla designer, Michelle B. 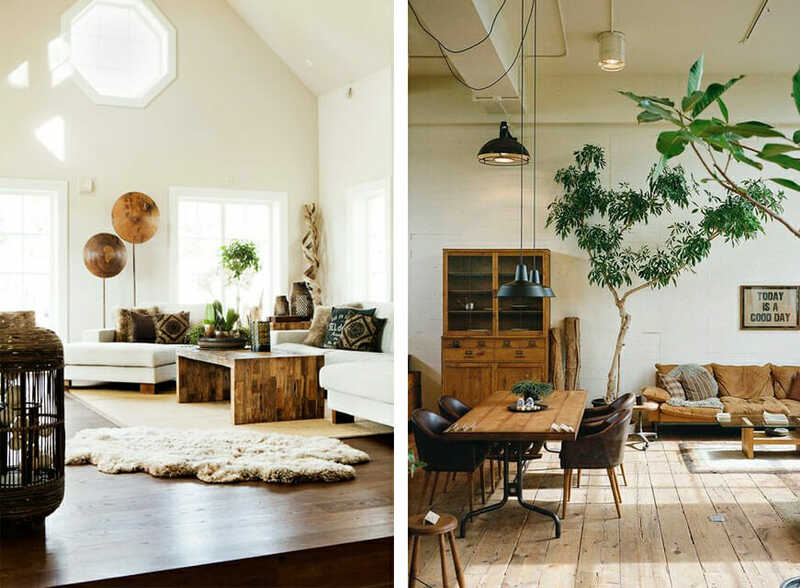 Following last year’s green obsession plants and the eco -dimesnion of interiors are staying one more year. Some forecasters tend to be even more specific, saying that succulents and textured plants will be one of the design trends for 2018 but no need to get in so much detail. Plants are amazing anyway. They are one of the best ways to decorate an interior, they are kind of affordable and the create this fresh feeling in the space that we all need. 4. Wallpaper (or art); No more empty walls! By Decorilla Designer, Jordan S.
Wallpapers were always an interesting twist all kind of rooms and spaces but now they are becoming more bold and decorative. 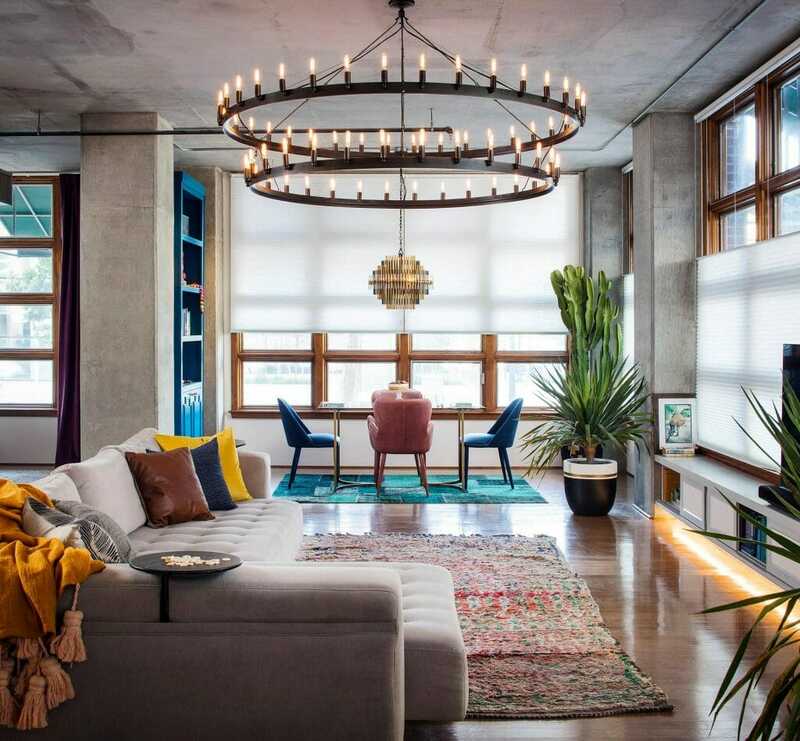 The interior design trend wants them to be used instead of art… Geometric patterns, landscape scenery or abstract shapes will take over our empty walls. 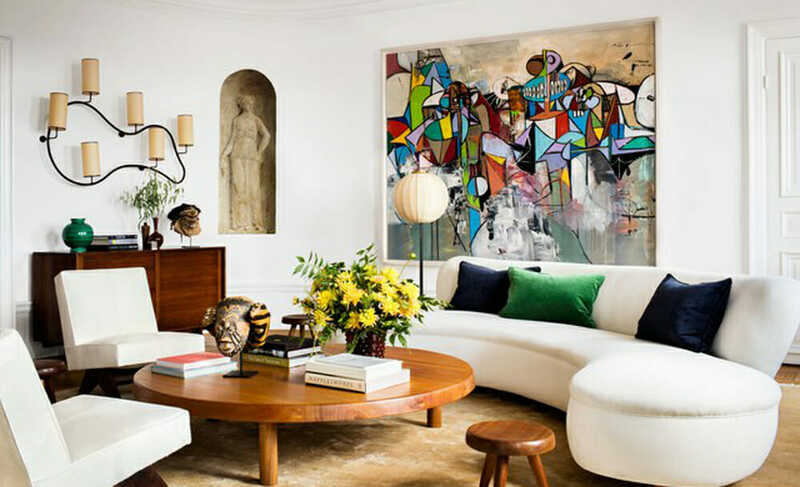 However if wallpapers seem like a too permanent or complicated choice, art pieces and gallery walls are a huge trend too. No matter if you prefer wallpapers or art, be sure that 2018 wants our walls filled and not empty. 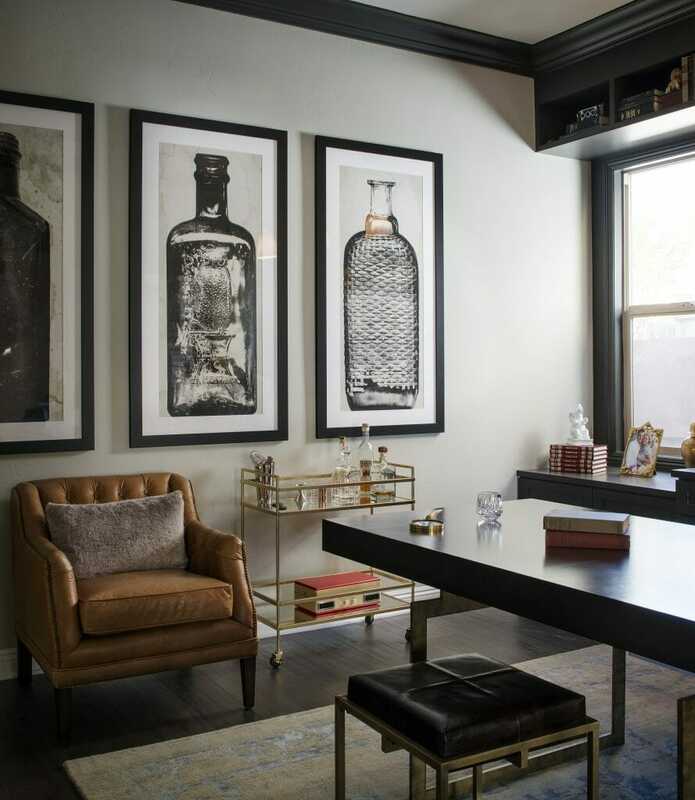 Home office design by Decorilla designer, Corine M.
Black couldn’t be included in the colors of the year because it is going to be used in so many ways that it is a separate category… While brass finish trend is becoming controversial, black finishes are being widely embraced as time goes by. 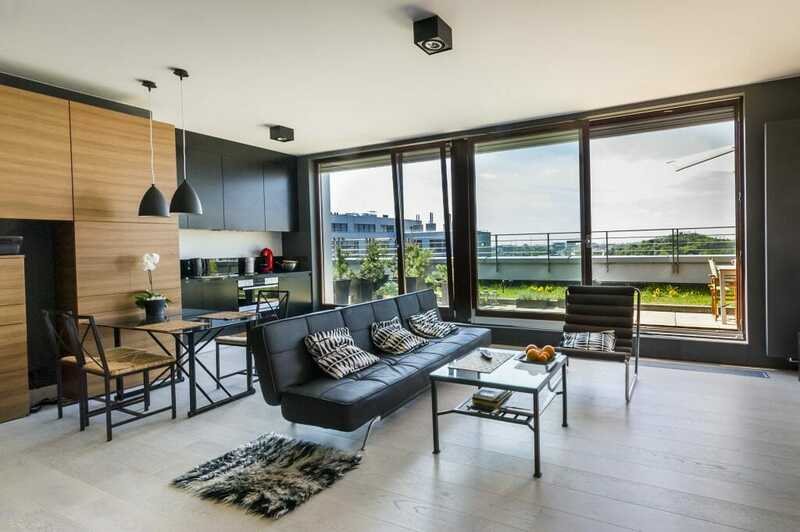 Black lighting fixtures, black window frames and black furniture details are all in line with 2018 design trends. 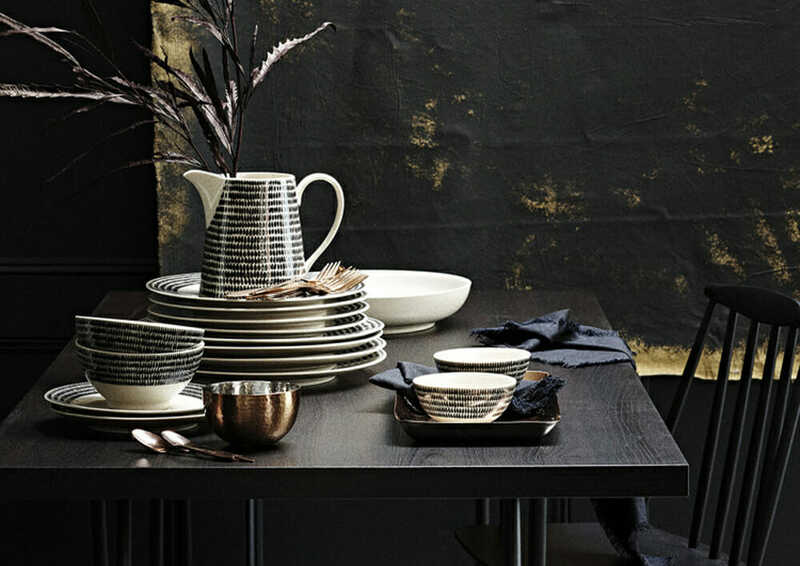 Living dining room design by Decorilla Designer, Amelia R.
Black (and white) patterns, prints, decorative objects and accessories have been introduced to us through scandinavian design style but now they are here to stay. If you are looking for a bold vibe and a feel of minimalism try the new graphic patterns and textures in any type of decor. Yes you read well! 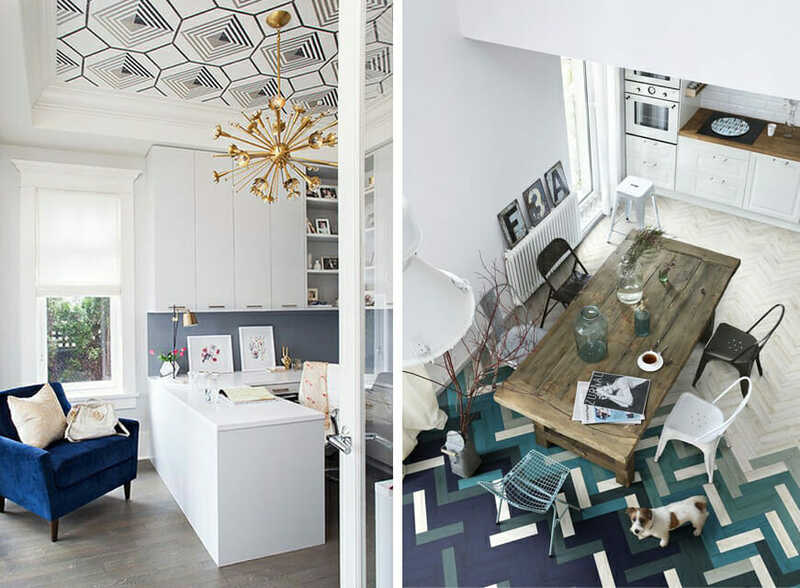 Statement ceilings have made a an entrance to 2018 interior design trends. Geometric patterns and bold colors are expected to be seen in our walls and floors but now you can see them to the ceilings too. 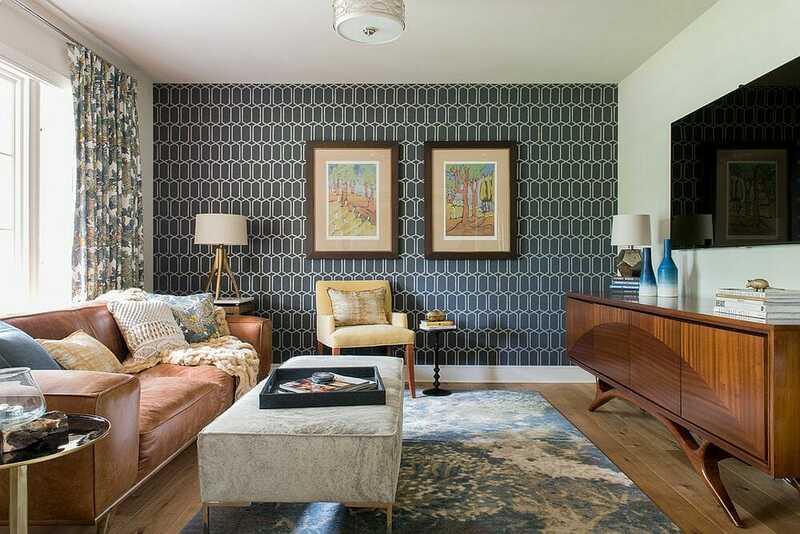 However if you feel that this is a too eccentric interior design trend for you, be aware that patterned flooring and walls can make definitely a statement too. By Decorilla Designer, Ibrahim H.
Interior design is taking a more eco friendly approach and we are looking for warm tones, natural elements and earthen luxury. Materials or items coming straight from nature or mimicking nature is addressing this need and make our spaces feeling more unique and authentic. 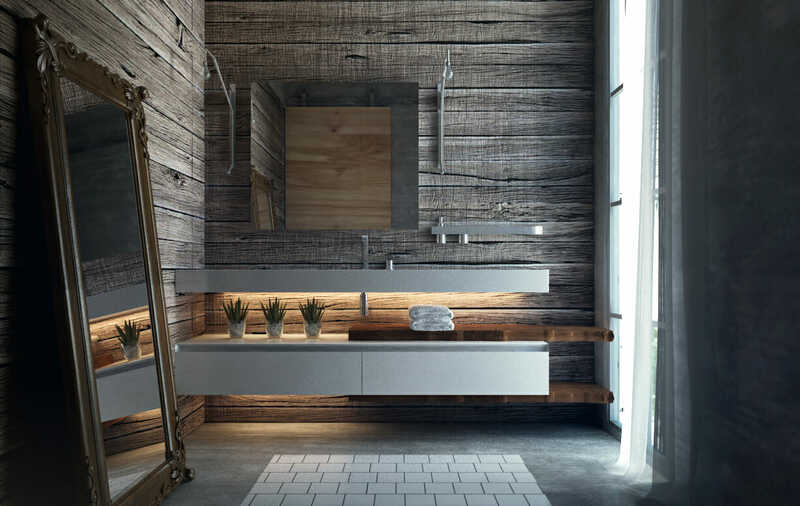 Be sure to check natural wood being applied almost everywhere and different stones like marble, granite, pebble or even materials resembling to these are also complementing the getting-closer-to-nature approach. In the same direction we will be embracing the handcrafted, the recycled, and the artisanal. We are heading over to a more relaxed era! We embrace curves, smooth fabrics, warm and earthy moods and colors, plants and nature. Pretty clear right? 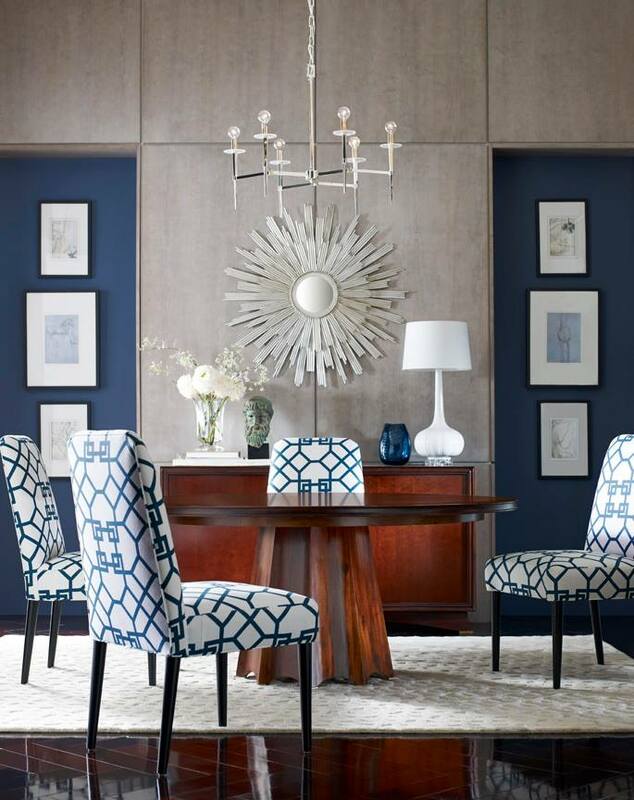 Find more ideas and trends that are starting to dominate 2018 in Elle Decor and Dering Hall. Want to learn how to incorporate a few of the latest design trends into your personal style, but not sure where to start? We’re happy to help! Schedule a Free Consultation to Start Designing your dream room with one of Decorilla’s talented online interior designers today. Written by Decorilla interior designer Anna T.